The wait was long and brutal, but it's finally over. Starting today, you can drown your Sims or order them to pee in the water to your heart's content. 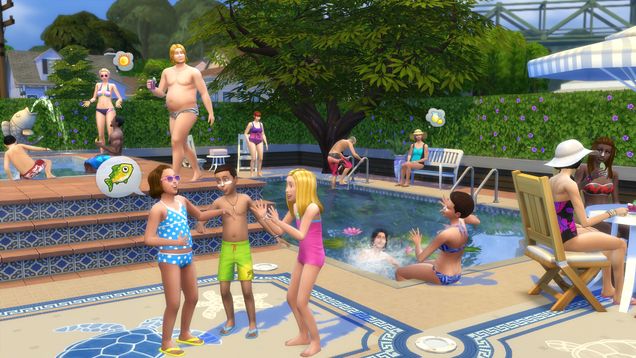 That's right: swimming pools are making their debut in The Sims 4 today. Right this very moment, actually, if all goes according to plan. Once again, you will be able to drown your Sims in the pools you create for them. Note that this adds another method of virtual murder (or death, depending on how you look at it) to the ten that The Sims 4 started out with. "Death by drowning" means that if a Sim dies because he or she drowned in a pool, they may come back as a new type of ghost with a special taste for water (see below). In addition to exercising, playing around, and calming down by using the swimming pools, Sims will also be able to pee in them. This is a great opportunity for mischief-making. The other Sims in the water might get a teensy bit upset, though. Swimming pools aren't just a subterranean fixture anymore either. EA says that players will now be able to build pools on any floor of a house or public building they're creating or modifying. That means you can create "a multi-pool mansion with pools on every floor" if you feel like it. You can also "place windows on the walls of pools to create an infinity-pool aquatic escape for your Sims," EA wrote in today's announcement. "And we've also added the ability to adjust the depth of your pools by adjusting wall heights." Since EA explained the (very controversial) absence of swimming pools at launch time by saying adding them was technically challenging, and prohibitively so, you might be wondering if their addition today means that we'll all be able to start building other types of features like, say, basements. Don't get your hopes up just yet. EA wouldn't say much about possible future additions, but a representative did simply note in an email: "We don't have basements in The Sims 4." Sims are also getting a new line of swimwear to go along with the new pools. Vaughan also offered me a bit more clarity about the new career options that The Sims 4 will get (again, for free for all existing players) next month. Vaughan told me that there will be two new career paths added to the game: "Business" and "Athletic." As with the current career options, both of this come with two different branches that Sims can pursue—"management" and "investor" for the business one, and "bodybuilder" or "professional athlete for the athletic one. I'll have more to say about those once they arrive in the game. For now, I'm gonna get started drowning my Si—er, building some fancy new pools.